As far as handcrafting goes, turning yarns into heirlooms with a crochet hook is just as one-of-a-kind as creating with knitting needles. And this year, the fashion industry has embraced crochet for its versatility and style. We thought this was the perfect time for a new Viewpoints book. Having culled together beautiful crochet designs from modern and skilled designers, we present you with A Time to Crochet, eight fresh and modern crochet patterns from seven different designers. 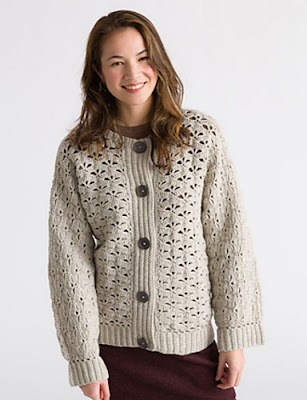 Kristen TenDyke combines Crestone and her eye for unusual construction to create Savona, a completely seam free cardigan. Dolman sleeves and the vertical textural strips of the button band are the added touches that make this cardigan stand out in the crowd. Susan Mills uses crochet stitches to build Livorno with raglan sleeves and a striking striped yoke. 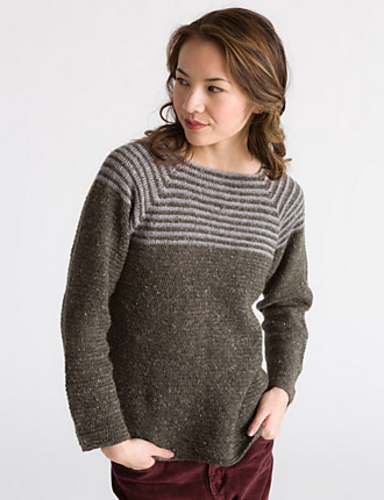 The donegal tweed of Telluride adds extra textural dimension to this classically shaped pullover. Robyn Chachula uses lacy crochet motifs to design Alessandria. The large ribbed collar and open sides flatters all sizes. The softness of Fresco allows this piece to drape beautifully about your body. Charles Voth makes Cerro's blend of soft pima cotton and alpaca really shine in his design Bergamo. He uses reversible motifs to form the stunning neckline and the airy lace stitches of the body are also reversible. Lillian May's crochet accessories are right on trend. 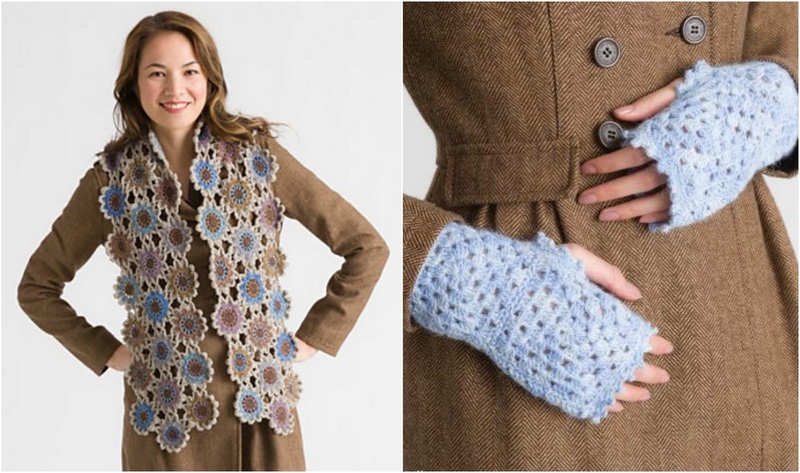 Combining Mohawk Wool and Telluride, she uses beautiful flower shaped motifs to form Ferrara. On the other hand, or on both hands in this case, 8 granny squares made of Alpaca Sox are seamed together to form the two fingerless mitts of Novara. Kathy North designed Biella with overlapping fronts in our bright self-striping colors of Camelot. Openwork edging is a lovely added detail that really completes the look. Jill Wright's Ravenna embodies the joyful lightness that can be achieved with crochet. Worked up in our much loved Mohawk Wool. The flow of this poncho moves when you do, keeping things simple and elegant at the very same time. With crochet firmly established as one of the top five trends of the year, this is a great time to give it a try! There are so many viewpoints represented on the art of crochet here, you're sure to find something that pulls you to pick up a hook and begin. When we knit and crochet, we not only feel connected to the fiber at our fingertips, we also are reminded of those who honed their skills at handcrafts before us. With Mother's Day just days away, we at CEY were talking about what influences our relatives have had on our love of creating things with our own hands. "I learned from both my mother and step-mother. Both of their mothers were also knitters. My mother’s mother used to knit in the ski lodge while my grandfather skied. This same grandfather used to work in the weaving mills in Uxbridge. He designed the fabric used as seat covers in Ford automobiles. He also was recognized for making the covers for the cameras in the planes during WW II. Working with fiber seems to be in the blood!" Model Lindsay and her son. "Ever since I can remember my mother and aunts gathered together to knit. I grew up with family knit nights. When I was little I tried my hand at it but somehow never succeeded at making anything more than some very interesting Barbie clothes. Honestly, in my teens I was "too cool” to appreciate what they were doing, but after I got out of college, I really came to appreciate their knitting so much, so my cousins and I joined them. Sadly, we don’t gather as much as we used to with the larger group. However, my mother, sister, daughter (age 23), and niece (age 9) do often get together and knit. My mother and I sometimes tag team projects since we seem to get the same gauge on different size needles. One of my most treasured possessions is a blanket that she did sections of and I did others.We passed back and forth until we finished it." "I learned to knit in the Girl Scouts; I had wanted to learn badly because my mother knit and my grandmother crocheted. The first real thing I knit was a long scarf with some kind of pattern stitch knit in an acrylic yarn, probably the only kind available in our neck of the woods. I was also learning to ski about the same time, and I proudly wore my scarf for a ski lesson. It got wrapped around the rope on the rope-tow and was completely ruined! Lesson learned – hand knits are to be carefully loved!" So we say 'thank you' to all who came before us and paved the way for the knitting and crocheting that we love so much. Who influenced your desire to create things by hand?